It is a pleasure to introduce you to this book which focuses on fundamental challenges and issues in the field of ad hoc networks and sensor wireless networks, one of the most active research areas in recent years. The book covers representative problems in MANETs and WSNs, including QoS topology control, connected dominating set backbone, broadcasting, energy-efficient routing, geographic routing, distributed localization, data gathering and data aggregation and sensor area coverage. Compared with existing books, this book gives comprehensive investigation without sacrificing theoretical depth of the selected topics. In particular, I believe the book will be a valuable companion and comprehensive reference for students who are taking a course in wireless networking. The authors of chapters of the book are distributed in a large number of countries and many of them are prominent researchers in ad hoc and sensor wireless networks. Readers of the book can get absorbed by perspectives, suggestions, knowledge and experiences by these authors who have been working with this area for several years. Mobile ad hoc networks (MANETs) and wireless sensor networks (WSNs) have received significant attention in recent years due to their potential applications in environment monitoring, traffic monitoring and controlling, mining and shipping security, animal tracking, battlefield, disaster relief operations and so on. Nodes in these networks are usually powered by batteries and self-organized into a network via wireless communications. However, unexpected failure of nodes, rapid changes of topologies, high error rates, collision interference, and bandwidth and power constraints together pose new challenges for this type of networks. This book presents some latest and representative developments in MANETs and WSNs. It focuses on some major and important problems in MANETs and WSNs and provides comprehensive survey of various architectures, algorithms and protocols for these problems. The book consists of eight chapters. 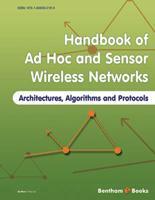 Chapter 1 discusses topology control which is one of fundamental problems in wireless ad hoc and sensor networks. The authors survey the existing work and describe their own work in both homogeneous and heterogeneous networks. Chapter 2 introduces an important concept called connected dominating set (CDS), which normally serves as a virtual backbone to reduce routing overhead in wireless networks. The concept can be extended to k-connected m-dominating sets (kmCDS) to provide fault tolerance. Energy efficient routing and broadcasting are fundamental topics and they are discussed in chapter 3 and chapter 4, respectively. Chapter 5 discusses geographic routing from both theoretical and practical perspectives. Chapter 6 discusses distributed localization which is a challenging problem in sensor networks since sensor data is typically interpreted with reference to a sensor’s location. Data gathering/aggregation and sensor area coverage are described in Chapter 7 and Chapter 8, respectively. The primary target audiences of this book are those who are interested in MANETs and WSNs and related issues. Typically they include scholars, researchers, developers and postgraduate students. The book could be a useful reference for university courses in wireless networks. Finally, we would like to express our sincere appreciation to all the authors of the chapters in the book.